The fifth element of the BSLS symposium was a welcome change of format, a workshop on building courses led by Allyson Purcell Davies and Yasemin Erden. I naively imagined that after 30 minutes brainstorming our group would have devised the perfect final-year module. As it turned out, this was a big opportunity to talk about other issues that had arisen during the day, so we got a bit distracted, and I don’t think we were alone in that. It was an enormously valuable session, but I’m not sure any courses were built at the end of it. My group talked about our different institutional contexts, with Janine Rogers’s Canadian one being very different, and also about why some courses recruit well and others don’t. We also talked about specific outcomes we might want to see: much that had been discussed under the heading of aims was fairly general and not specific to textual study, and I made a case for the importance of historically informed linguistic sensitivity to figurative language: something that might in part be developed through reading Lakoff and Johnson, but which only becomes historical by reading scientific source texts. We also talked about the different marketing strategies for a literature and science course: do you title it as ‘literature and science’ and place that at the very centre, or do you devise a different topic (e.g., ‘the body in the fin de siècle’) and work the science in as part of the content? the different approaches one needs to take in a class: the need to be ‘teachery’ for some texts, which I think meant provided formal exposition and specific guidelines, in recognition that absorbing historical science and history of sciences approaches can’t be done by extending existing literary-critical skills. outcomes (in a large sense): understanding the ethical implications of literature and science knowledge. how to subdivide ones topics, e.g., historically or thematically? One compromise solution suggested was to pick a theme (e.g. the body) and to historicise within it. the question of validity in interpretation: what rules apply in literature and science, and how do they differ from those in the literary criticism the students have previously encountered. What focus should one take? Should one focus on authors, or on the culture and the readership? Should one look at the history of forms of writing? This entry was posted in Higher Education and tagged BSLS, Literature and Science, pedagogy, teaching on 11/11/2014 by michaelwhitworth. Our third session was an unexpected pleasure: three tutors talking about the opportunities they’d had to teach creative skills and/or literature to science students in a British context. (In the afternoon we also heard from a science major who had taken Janine Rogers’s course at Mt Allison, Canada.) My only disappointment about this session was that because the institutional structures that all three were working in were so unfamiliar, I felt I’d missed crucial details about exactly what they were offering and how it fitted in. Vic Callaghan (Essex) was speaking on behalf of the Creative Science Foundation. Vic had started his academic career in electronic engineering, before moving over into computer science and A.I., and gave a compelling account of how, right at the start, he had been inspired to do science by reading science fiction. The main theme of his talk was the increasing recognition that technological innovation requires creative imagination, and that science degrees tend to knock it out: scientists favour cautious approaches and ‘incremental thinking’ over imaginative leaps. Engineering curricula are packed full with content; there’s little space for creativity. This has become a particular problem for chip manufacturers like Intel, for which the average duration between a new processor being imagined and its going into production is an astonishing seven years. The problem is that the consumer side of the market innovates far more quickly: mobile phone designs are superseded every 18 months or so; the Intel chip designer has to imagine future uses for processors that haven’t yet been invented. Intel’s approach was to try to wean their designers away from the scientific mindset they’d been trained in (in terms of there being right/wrong answers to any problem, etc. ), by telling them that they could use fiction. They used stories as a way of ‘wrapping up’ the technology and as a way of communicating the ideas. Duncan Mackay, an astrophysicist from the University of Kent, contrasted himself to Vic, and picked up on Charlotte’s earlier question about what it is we do, by noting that his science is completely non-utilitarian. 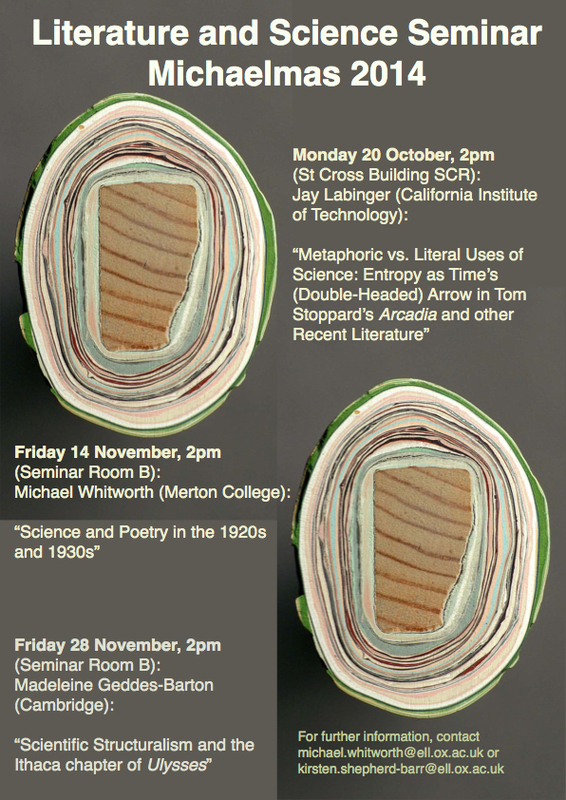 His methods of engaging students with creative material were (i) to get them to paraphrase poems in terms of mathematical formulae (the symposium noticeboard had a weird rewriting of one of T. S. Eliot’s ‘Preludes’), and (ii) to get them to identify conceptual metaphors and ‘image schemata’ in scientific work. This was intriguing stuff (I was interested to know how much theoretical grounding he gave them on the latter), and I would have liked to hear more details. Matt Wraith comes from a literary-critical disciplinary background, and runs the Horizons programme at Imperial College, aiming to broaden the coverage available in a science institution. He noted that the motivations of the institution, the students, and the tutors are not necessarily identical, though there wasn’t time for a more detailed analysis of whether the gaps between those motivations, and the tensions between them, are productive or limiting. After lunch we moved to the question of how literature and science does or doesn’t fit into institutional expectations and structures. In so far as other sessions had made reference to institutional traditions, outlooks, tendencies, limitations, etc., these weren’t entirely new questions, but it was valuable to foreground them. Emily Alder (Edinburgh Napier) has recently offered a module ‘Narratives of Nature’ which consists of literature and science with an eco-critical slant. The background to her offering is the Scottish educational system which, relative to the English, requires students to cover a broader range of subjects up to university. Joint Honours programmes are popular at Napier, and her module needed to recognise that; it also needed to work around the other modules, which had already claimed a lot of the gothic and genre fiction texts that she might otherwise have taught. One of the most innovative elements that she has been allowed is an assessment portfolio in which students chose (in consultation with the tutor) how to demonstrate that they have achieved the learning outcomes. The institutional pressures that Greg Lynall (Liverpool) talked about were partly those to do with modules competing with each other, and departments not wishing to run modules with less than optimum recruitment: any new module could be offered only at the expense of an existing one. Greg has taught literature and science in one form or another for ten years; his most recent offering is part of an interdisciplinary eighteenth-century studies MA at Liverpool. This brings with it the pleasures and problems of teaching students who are confident in one of the disciplines but weak in another: e.g., historians who are confident talking about economic issues, but unpracticed at writing literary-critical essays. Josie Gill has just begun a lectureship at Bristol, where her job title is Lecturer in Black British Writing of the 20th and 21st Centuries, so literature and science teaching was not formally part of her remit; however, it has been relatively straightforward for her to introduce a third-year module on contemporary literature and science, with the earliest text being 1990. She covers topics such as the Human Genome Project, science on stage, and David Lodge’s recent forays into science. Her week on looking at science as writing was queried by the department, but within literature and science studies this is a very common skill to develop; she insisted on its inclusion and the department allowed it. She reported that she’s found teaching literature and science good for the students because it provides a space in which they can reflect on what it is they are doing in studying literature, and in which they can think about the modern university and its structure. This entry was posted in Higher Education and tagged BSLS, Literature and Science, pedagogy, teaching on 10/11/2014 by michaelwhitworth. The second session turned from larger questions of motivation and philosophy to more detailed account of methods and approaches. It’s harder to take precise notes in this kind of session — I didn’t manage to write down all the texts the lecturers had mentioned as being on their courses — so the account here may seem thinner than my account of the first session, or may distort it towards the more abstract questions. Rebecca Lindner and Shannon McBriar teach at Amsterdam University College, a very recently founded small liberal arts college (about 850 students) in Amsterdam, part of a network of such colleges that has arisen in the Netherlands in recent years. Theirs attempts to differentiate itself from the others by making science a significant part of its profile, with the result that humanities students can feel marginalised. 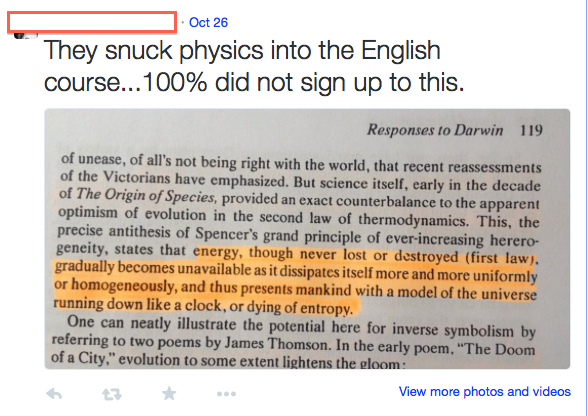 A literature and science course can work well in such a context. Their literature and science course covers a long duration, from the early modern to the present. It makes thematic divisions, using large themes such as mind, body, and place. It covers many genres of writing, such as early modern anatomy texts, travel narratives, etc. In practice Rebecca and Shannon found that the thematic boundaries collapsed. Ros Powell teaches at Liverpool Hope, and runs a final-year module ‘Reading Enlightenment’. It begins with Bacon’s New Atlantis and ends with Samuel Johnson’s Rasselas, and covers themes such as imagined worlds, man’s place in the world. Ros described her aims as being to educate her students about science in a historical way: that includes historicising ‘science’ itself and making them familiar with historical categories such as ‘natural philosophy’ and ‘the virtuoso’. She’s asking them to think about the nature of Enlightenment; about scientific diction and genre, and what happens to scientific ideas and terms when they are transposed from one genre to another. She encourages students to think about the choices that scientists made in their discourse, and encourages students to be independent, finding their own texts on databases such as ECCO (Eighteenth-Century Collections Online). Greg Tate teaches at the University of Surrey, in which English is a relatively new subject; it’s historically a science and engineering university. This situation has allowed him more flexibility than might have been the case in a department that was set in its ways. Greg offers both a second-year undergraduate module and an MA module. The undergraduate module, ‘Science Fictions’, compares representations of science in Science Fiction texts with those in drama, nineteenth-century fiction, and other forms. The MA module is more explicitly a Literature and Science module. The big question Greg had to ask us was whether there’s a pathway from undergraduate literature and science to MA level to doctoral level, and how we might describe those levels: are there concept, texts, or methods that you have to teach at each? This is a huge topic, and one which didn’t picked up at the length I’d have liked in the questioning, though we did have some good informal discussions over tea. Other questions Greg raised were how to deal with students’ anxiety about talking about science; and how to introduce students to the idea of two-way traffic between science and literature. (And, one might add, at least at a higher level, how do you teach them to be discriminating about the conditions under which such traffic can meaningfully occur. You can name your subatomic particles from a word in Finnegans Wake, but is that, in itself, meaningful traffic?). Greg returned to the question of how to differentiate levels: his answer was that his undergraduates don’t read many scientific text directly, while his MA students do; and his MA students are expected to think about science as a genre. (For myself, I’d be keen for undergraduates to make steps into being alert and critical readers of scientific texts, and for many years at Bangor, and more recently at Oxford, I’ve used extracts from Darwin’s ‘Essay of 1844’ as a way into one kind of scientific writing.) Finally, Greg asked about the assessment and delivery of the MA module, and in particular the question of whether it should be preparing students for doctoral level. The feedback Michelle has received so far suggests that the students feel there are too many new ideas for them (though I’d be inclined to see that as better feedback than students saying there are too few); and that, as regards their reasons for choosing the module, that they were very curious about the conjunction of literature and science. The problems she has encountered echoed those mentioned Charlotte Sleigh in the first session: (1) introducing history of science; (2) getting students to think about science influencing the form of the text, which requires them to grasp concepts of form; (3) the problem of the two-way street. As regards the larger question of motivation, Michelle mentioned wanting her students to engage with ethical issues (e.g., vivisection in The Island of Dr Moreau), and wanting them to be empowered to interrogate science. Finally in this session, Fran Kohlt from Oxford spoke about her experience of teaching a literature and science class within the Oxford tutorial system (at St Anne’s College) on the first-year Literature in English 1830-1910 paper. The primary texts she chose for this two-hour event were Charles Kingsley’s The Water Babies, essays from Kingsley’s Scientific Essays and Lectures, and essays by T. H. Huxley, including ‘Evolution and Ethics’. The relation of religion and science had been important for this session. At the end of the session she had got her students to form small groups and to report back on one of three topics, using brief quotations prompts: Gillian Beer on myth-making as a proto-science; another on mysticism and science; and George Levine on the idea of there being one culture. Fran went on to talk about how she transposed this session to work for a summer school group of fourteen year olds. This entry was posted in Higher Education and tagged BSLS, Literature and Science, pedagogy, teaching on 09/11/2014 by michaelwhitworth. (1) Why Teach Literature and Science? Martin’s opening words set an important frame for the first session, ‘Why Teach Literature and Science?’, in which Will Tattersdill, John Holmes, and Charlotte Sleigh addressed the larger question of motivation, as well as giving us snippets of practice, sketches of their institutional context, and anecdotes of their point of entry. This informal and personal tone was an important feature of the day as a whole: there are all sorts of personal investment in the topics we choose to teach, and in a supportive environment it’s useful to touch on them. John had taught, around 2005-06, a module called ‘The Literature of Science’, and had later taught MA-level courses; right now he’s preparing a fascinating interdisciplinary module at the University of Reading which will involve tutors and students from biology, history, and literature. Literature students will do scientific experiments; science students will study literature. For John, there were three main reasons why he teaches literature and science. (1) To break down the retrospective imposition of two cultures on cultures where there was no divide between literature and science. (John sees the divide as arising in the late nineteenth century.) (2) To counteract the entrenched arts / science divide in UK educational culture. (3) The civic argument: ‘we live in an age that is defined by science’, John said, and so it’s important from a civic or a political point of view to understand it correctly. (I’d want to qualify this as above by asking whether there’s a single right way of understanding it, but I’d agree that most arts students could easily be better informed about the practices and content of science.) As science doesn’t have much political clout, we get some weird distortions in its representation: on the one hand, scientism and an excessive optimism about its ability to solve human problems, and on the other hand anti-science positions. There’s a particular problem about the media misrepresentation of science, exemplified by the media on climate change feeling obliged to demonstrate ‘balance’ (one climate-change ‘sceptic’ vs. one informed scientist). Scientific truth isn’t determined by processes of majority voting. Charlotte’s career trajectory differs significantly from those of the other two speakers: her school, for honourable reasons, had directed any girls who were good at science to choose it at A level and beyond. During her degree she turned to history of science, and has since then begun work in literature and science. At Kent she had taught a big first-year course that covered literature and science from Swift to the present, but found that it was asking too much of the students: they had to absorb some science, some history of science, and some literature; she gave up on this module. Recently, she has devised a final-year special subject module, which — unusually when semesterisation is the norm — runs for the whole year and allows her to practice ‘slow reading’ of big texts like Middlemarch and The Origin of Species. The module has a special appeal to History and English Joint Honours students at Kent who hitherto had lacked any kind of bridge module. Charlotte turned the motivation question on its head and asked ‘why not teach lit and science?’ There are risks: there’s a danger that nothing gets done properly (everyone gets a smattering of history of science, etc. ); that people enjoy the frisson of working on the borderline but don’t do it rigorously; that lit students make bad historians and historians treat literature as a ‘light’ source, treated without the rigour they’d bring to ‘real’ historical documents. On the question of ‘why now?’, Charlotte noted that in academia the ‘science wars’ (post-Sokal Hoax, etc.) are now over, even if they might still be going on elsewhere. She noted that if science studies is all about the critical appreciation of science, in an era where science needs to be treated seriously — above all in relation to climate change — and defended from its detractors (she wasn’t specific, but I’d gloss that as religious fundamentalists and big business), then the emphasis has shifted from the critical to the appreciation. Duncan McKay said something at this point about the positive value of doing neuroaesthetics, and I’m sorry I didn’t make a proper note of his real point, though if I recall correctly, it was that in doing it the practitioners come to recognise the limitations of their form of knowledge. Greg Tate suggested that our motivations for teaching might not be so far removed from our motivations for doing research in this area. Laura Ludtke argued that literature and science offers us a view on the value of the humanities. Charlotte opened the question of where there’s an asymmetry between science and literary criticism, and the related question of what this ‘literature’ in ‘literature and science’ is anyway: is it literature, or literary criticism? Scientists might think they make real things: not just technological spin-offs, but real knowledge, where literary critics seem only to write about writing. I.e., the value of science seems to relate to the distance between its object and its medium. Barri Gold suggested that maybe in many cases scientists don’t know what it is they do. I’ll summarise the later sessions in separate blogs. The whole event was videoed, and will be posted online by our hosts at the University of Westminster and/or the BSLS, and I’ll add a link there when this session is available. This entry was posted in Higher Education and tagged BSLS, Higher Education, Literature and Science, pedagogy, teaching on 09/11/2014 by michaelwhitworth. I came across the image a few years ago, and am pleased I’ve found its source: a short film made by John Smith called Dad’s Stick (2012). This entry was posted in Higher Education and tagged Literature and Science, Poster on 07/10/2014 by michaelwhitworth. Of all the ‘truths’ in Tara Brabazon’s ‘Ten truths a supervisor will never tell you‘, the one that surprised me the most was no.9: ‘Weekly supervisory meetings are the best pattern.’ I know that my colleagues in Chemistry, and no doubt in other laboratory-based subjects, meet weekly with their supervisees, and see them frequently between those meetings. But is this a good pattern for the humanities, specifically for English Literature? I’m not sure it’s a viable pattern. The Oxford English Faculty handbook currently states that candidates ‘may expect that their supervisor will provide at least two extensive supervision meetings in each term’, and that the candidate will provide a substantial piece of writing towards the thesis each term. In Oxford, someone in my kind of post — a ‘University Lecturer’ in English — has a normal supervisory load of 6 PhD students, as well as having undergraduate lectures and tutorials to deliver, and usually some involvement in the M.St. Weekly meetings would represent a significant increase in contact hours. What would have to give? Not my own research — there’s never time to do that in term — but more likely the extras such as convening a research seminar. Even if extra hours were discovered in the working day that would allow weekly meetings, would such a pattern actually be desirable? To hold weekly meetings would be to keep a graduate student in an essentially undergraduate pattern of teaching. I have some experience of this pattern, acting a supervisor to American doctoral students who have been in Oxford looking after JYA undergraduates. The meetings reassured me that the doctoral students — both focused and industrious researchers — were putting in the hours in the library, but the written work presented for each meeting tended to be lists and brief notes. My real concern is that a weekly periodicity might discourage exploratory reading and the kinds of discovery that come serendipitously. I’m sure my doctoral students could manage to write weekly essays of, say, 3000 words; but I suspect that if they did so they might fall into relatively mechanical ways of doing it; and that even if the material varied from week to week, the argument or the method would remain substantially the same. Brabazon justifies weekly supervisions by saying that some postgraduates ‘lack time-management skills and would prefer to be partying, facebooking or tweeting, rather than reading, thinking and writing.’ I’m inclined to think if they’re so completely absorbed in those vices as to be unable to produce written work (or other substantial evidence of progress) every month or so, they shouldn’t be doing postgraduate research. (My own guess is that postgraduates are far more likely to get distracted from their theses by diligent teaching preparation or by finding new, shinier and more exciting topics; this second one is the bad side of exploratory reading.) Maybe if there’s a crisis a postgraduate will need to be put onto the intensive care regime of weekly meetings; but I wouldn’t see it as a desirable norm. Postgraduate study should foster time-management skills and scholarly independence; in the Humanities weekly meetings could do the opposite. A good supervisor will be there for an extra meeting if there’s some sort of crisis in the project, or a practical difficulty with obtaining texts; but he/she will also allow the student space to develop the project and his/her thinking. This entry was posted in Higher Education and tagged Brabazon, doctoral, doctorate, PhD, supervision on 22/07/2013 by michaelwhitworth.